History of our Bed and Breakfast, Key West, Florida Originally, built as a private home for a wealthy Charleston merchant family in 1880, this grand three-story Victorian mansion was then converted into the Island City House Hotel by its owners, in anticipation of the railroadâ€™s arrival in 1912. After a faithful restoration, this house offers 12 parlor suites, each individually furnished with Victorian antiques, lace curtains and hardwood floors. 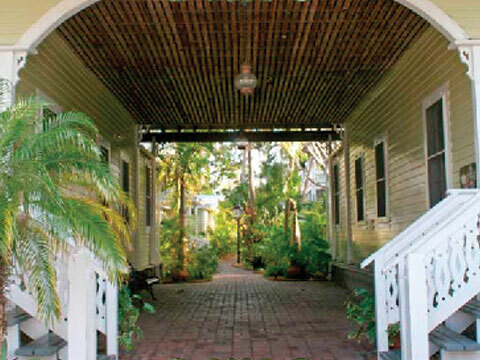 Key West Florida Hotels The Island City House is the main building on our property housing twelve parlor suites, ten one-bedroom suites, and two two-bedroom suites. These suites are furnished in an island Victorian style with lace curtains and many antique pieces. The two bedroom suites have two separate bedrooms, one with a king bed, the other with a queen bed, a living/dining room with a full kitchen, one bathroom and a large porch. The ten parlor suites have one queen-size bed and a separate sitting area with a kitchen. Many of these suites also have a sleeper sofa (for children or a third adult) or a porch overlooking the gardens.